Chronic kidney disease (CKD) includes conditions that damage your kidneys and decrease their ability to keep waste products at low levels, leading to their accumulation in the blood. This in turn slowly causes harmful effects to the body. The harmful effects of CKD include complications like heart and blood vessel disease, anemia (low blood count), weak bones, and nerve damage. Heart disease is the major cause of death for all people with CKD. You can reduce the risk of CKD progression by controlling diabetes and high blood pressure, which accounts for the vast majority of the causes of chronic kidney disease. 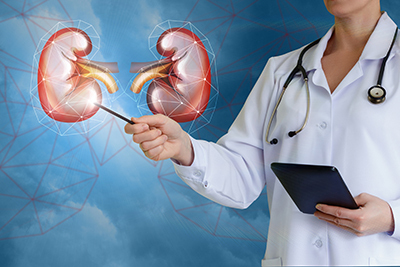 Damage to the kidney's filtering units (glomerulonephritis), cystic disease, urinary obstruction, and repeated urinary infections are some of the other conditions that affect the kidneys. Symptoms are varied and include feeling tired, low energy, trouble concentrating, poor appetite, swollen feet and ankles, and puffiness around your eyes, especially in the morning. Some may not experience any symptoms until the last stage (near dialysis). Simple blood and urine tests can reveal your kidney function, and will be able to tell us your stage of CKD. With expert and diligent care, the fall in the filtration rate (GFR) can be slowed. To get more information about Chronic Kidney Disease (CKD), or you're looking to ask a question, or request an appointment, please fill out the contact form below. You may also email care@mykidneymtn.com, call (615) 452-3250 or click here.